For those that move heavy freight like steel, you know that labor-intensive options don't make a lot of sense, but what options do you have. At Innovative Transport Solutions, we have been helping those that ship steel and other heavy awkward freight by providing smarter solutions to some of the most difficult and heavy shipping challenges. 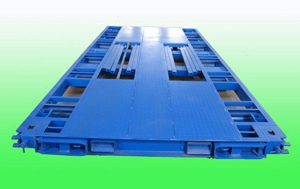 Designed to hold up to 26 tons of freight, the Mobile Transport Tray (MTT) helps steel shippers take a load off. Instead of manually intensive processes, once stacked on the tray, your steel can be moved into a standard container under a minute using a standard forklift truck. The MTT helps shippers like you to take a load off and work smarter. Check out the MTT in action and then let our team at ITS help you move your freight smarter.